Our current abode is our third house and also our third washer/dryer set. 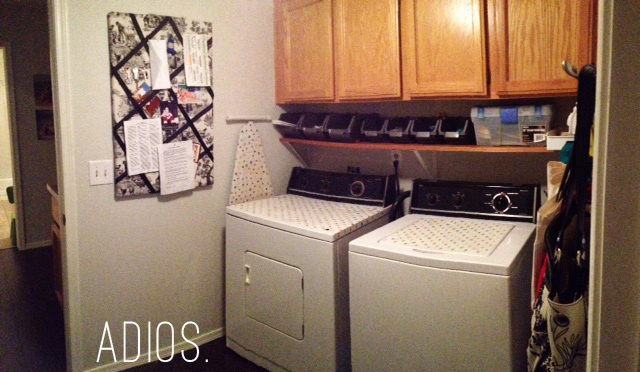 All of our laundry rooms have come pre-equipped with appliances and we never even considered buying new ones. They worked fine and they were free. No complaints! The set that came with this house has been the worst by far. No hot water, broken knobs, tiny capacity. Right after we moved in, the washer hose disconnected from the wall and flooded our laundry room and ruined a section of our brand new wooden floors. (lesson learned. All laundry rooms from hence forth will be tiled). I recognize this is a very first-worldy type problem. My brother just spent 2 years in a place where most women did their laundry with a large bucket and a stick. I'm not beating our shirts on the rocks down by the river. My washer and dryer may be crappy but they're certainly better than a lot of the alternatives. I thought I had made my peace. Last Saturday we made a family trip to a local appliance store. As the appliance salesman started discussing the features of all these shiny new washers and dryers, I full on started to cry. Right there in the middle of the appliance store. I'll love you forever. I'll like you for always. As long as I'm living, my laundry you'll do. Hooray for new appliances! I kind of love laundry, so having a new fancy washer and dryer must be really fun. 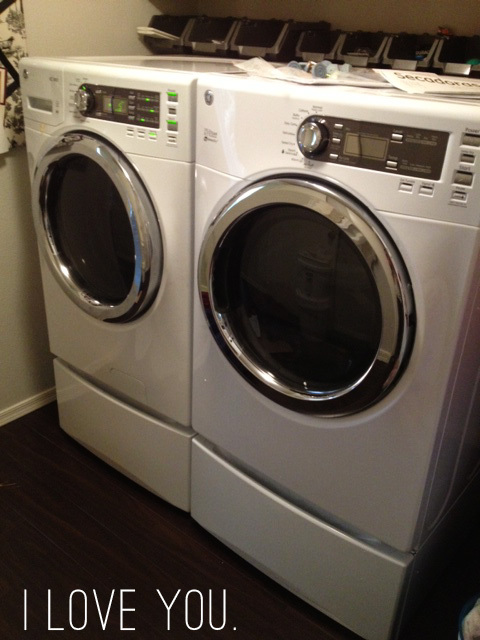 Congrats on the new washer & dryer! I would say this is a fantastic first world problem. Hahaha. I hope those tears got you a good deal! Those look beautiful. Someday I'll have gorgeous front loaders. i have all the jealousies in the world. it has been and will be years and years and years until i have something like that in my abode. le sigh. enjoy them an extra bit for me. one caution.....keep your washer door open to let it well dry out. i learned my lesson the hard way and dealt with a lot of mold issues until i realized it was growing all behind the gasket and around the door..... but that said...i love my front loaders and you will too! !